Stewart Hillman grew up in Ontario and went to college in Detroit. In 1988, he played baseball in Korea. And he did so for his home country of Canada in the Olympics. With Hillman on the pitching staff, Team Canada ultimately picked up one win and two losses at the games. Hillman then turned pro, getting into his first games the next season in Idaho. Hillman, though, ultimately played just two seasons. He never made AA. 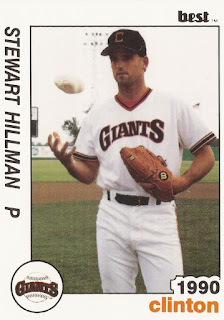 Hillman's pro career began in 1989, taken by the Giants in the 23rd round of the draft out of the University of Detroit Mercy. As a pro, Hillman started at rookie Pocatello. In 14 games, 13 starts, Hillman went 4-8, with a 4.77 ERA. He also struck out 70 in 88.2 innings. In 1990, Hillman started the season at single-A Clinton. He went 1-5 in 17 outings, 10 starts. He had a 3.32 ERA. He then moved to the Angels system mid-year. He got seven outings, one start, at single-A Quad Cities. He also got seven outings, one start at high-A Palm Springs. He had a 3.68 ERA at Quad Cities and gave up 15 earned in 10.1 innings at Palm Springs. It was his final season as a pro.